The 26.75 metre motor yacht Theodora Mia, listed for sale by Marine Marketing, has been sold with the buyer introduced by Costas Dimopoulos at IYC Greece. Launched in 2008 by Sanlorenzo as part of the yard’s SL88 collection, she was built from a fast-planing composite hull and GRP superstructure to an in-house design. The broker adds that she has been impeccably maintained ever since by her original owner, who has carried out multiple upgrades. Accommodation is for eight guests split between four cabins, including a master suite, VIP cabin and two twin rooms. All cabins have been fitted with modern entertainment systems, while the crew quarters allow for a staff of up to three people. Her elegant interior is by Franco and Anna Della Role, with a light colour palette, rich leathers, fine woodwork and splashes of colour. Key features include her main saloon with its extensive lounge seating and separate formal dining area, which is situated adjacent to the galley. Moving outside and guests can relax on the foredeck sunpacks or enjoy a light meal in the sheltered aft deck. From here, a short flight of steps leads down to the starboard swim platform, which provides easy access to the sea. However, the star of the show is the flybridge, with its combination of sunpads, dining space, sunloungers, bar area and tender storage space. Power comes from a pair of 2,185hp MTU engines that allow for fast cruising at 25 knots, topping out at 30 knots. 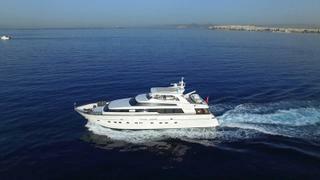 Theodora Mia was asking €2,950,000 with VAT paid.